Travelers are voting KwaZulu-Natal High Court, KwaZulu-Natal High Court and Northern Cape High Court as the best of 4 court houses in South Africa. Also popular is North West High Court in Mafikeng. Want more? 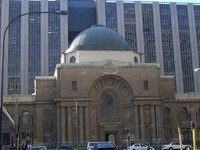 Check out our map of court houses in South Africa or this 1 court houses in Durban.